"Tilapia" is the generic name for a group of Cichlids endemic to Africa and the Middle East. Cichlids have a body shape similar to North American sunfishes which are often called "pan fish". 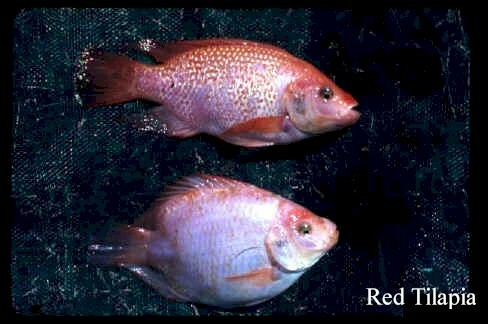 Within this group three genera: Oreochromis, Sarotherodon, and Tilapia are aquaculturally important. Several characteristics distinguish these three genera but possibly the most critical relates to reproductive behavior. All Tilapia species are nest builders, with the fertilized eggs being guarded in the nest by a brood parent. Sarotherodon and Oreochromis genera are mouth brooders: eggs are fertilized in the nest but parents provide even greater protection by immediately picking up the eggs in their mouth and maintaining them through incubation and for several days after hatching. The most positive aquacultural characteristics of tilapia are their tolerance to poor water quality and their ability to utilize a wide range of natural food organisms (i.e. omnivorous). The greatest biological constraints to the development of commercial tilapia farming are their inability to withstand sustained water temperature below 50-53 degrees F (10-12 degrees C) and their early sexual maturity. This later results in overcrowding, stunting, and few that reach marketable size. 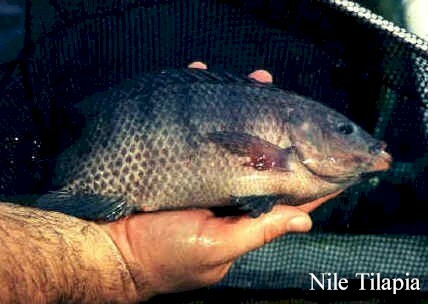 Still, tilapia are second only to carps as the most widely farmed freshwater fishes in the world. As of the late 1990’s world harvest of farm-raised tilapia had surpassed 880,000 English tons (800,000 metric tons). In the U.S. tilapia are farmed mostly in intensive recirculating tank systems or in cages (warm season only). Most U.S. states require special permits to possess and farm tilapia. (Text and photos courtesy Michael Masser, Texas A&M University).